J.S. “Jack” Ratcliffe, one of the key figures in the early days of the AMU and Musicians’ Union, served in France during World War I and, while there wrote a couple of letters to the AMU’s then leader, J.B.Williams. These were published in the September and December 1916 editions of the Musicians’ Report and Journal, the Union’s magazine for members. These give an insight into his work in the army, the danger to which servicemen were exposed and in the War, but also showing is continuing concern with Union issues of the day, most tellingly the role of military musicians. 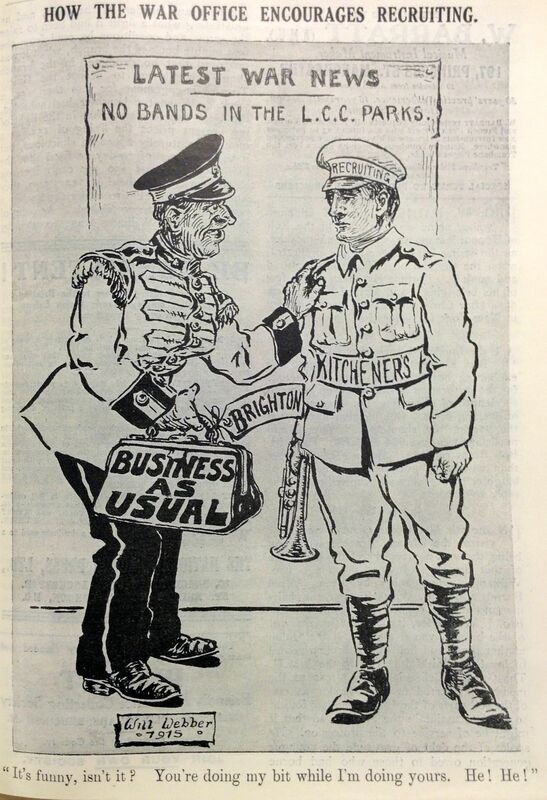 As referred to in Ratcliffe’s second letter, this was a huge issue for the Union, and its journals of the time were full of both cartoons (like the one left) and diatribes about the military musicians who stayed at home while musicians were sent to War. This situation arose because the military viewed its own musicians as important in the winning public support at home for the War and also for improving morale. Of course, this served only to amplify the Union’s peacetime resentment of military musicians, who had been a source of irritation on the grounds that they were undercutting prices and taking away work from its members. I have been in France four weeks today, and thought you might like a line or two for the journal. We only stayed one day at the port of disembarkation, and after a 17-hour train ride and a week’s knocking about three villages, our boys entered the trenches. They have finished their first spell and are out for a few day’s rest, and will be in again tomorrow, probably. My particular job is to look after the rations, etc., for the 7 officers and 140 men of the Headquarters Company. The rations are brought to a point about six miles from our front line, where I draw my share, apportion them to the various sections, and pack them up. They are then taken by transport to a light, single-lined railway and loaded on to trolleys, some drawn by motor tractors and others by mules. When it is dark we run up with them to the rear of the trenches, where a party meets us to carry them up to the front line, where I see them distributed. This journey is not unattended with a certain amount of risk. We are open to shell fire all the way. One spot we pass is covered by a machine-gun, which, owing, to the darkness, cannot see us, but lets off a round or two occasionally in the hope of catching us. Once in the trenches, we are comparatively safe, as our front being only 50 yards from theirs, they cannot shell us without considerable risk to themselves. The bullets from their machine guns and snipers whistle away overhead. The greatest risk is from “oilcans.” i.e. trench mortars click here for more info. It’s hard work at times. Once I did 68 hours, with only one three-hour interval for sleep and 26 hours without food. Something like organising, isn’t it? Still, i feel well and strong, much more athletic (I’ve lost a good bit of fat), and so far, I am rather enjoying it. The change in our men too, is remarkable. They are ready for anything, and quite anxious to be over the parapet and after the Huns. I am rather surprised at myself too. The very first night I went up the line our motor broke down right in the line of a big German “Strafe,” with heavy artillery and the wheels screaming over our heads and bursting about 50 yards beyond, and yet I felt quite unconcerned. The absolute disregard of danger here by everybody is one of the most wonderful things I have ever struck. Everybody about here is very optimistic about the final result, and anticipates as early finish. ‘About Christmas’ is an easy favourite. Kind regards to all old friends at home, and hoping to be back among them someday as “whole” as possible. In October 1916, Ratcliffe wrote again, and this was published in the December 1916 edition of the Report and Journal. This time, he concentrated on Union related matters, signing off as Drum Major Ratcliffe and addressing Williams as ‘Sir and Brother.’ Having predicted that the War would be over by December 1916, he is now less optimistic about any imminent return. Just a line again to let you see I am still alive after nearly four months of it, and I am also still very fit and well too. I have been going to write several times, but always put it off. All the activity here consists of mining, raiding (at which we have been pretty successful) and throwing all sorts of stuff at each other day and night. I have met several musicians out here. Armgill, a sergeant of the ASC1, I see nearly every morning, was flautist at the Lyric, London and Percival Goffin, the musical director of Spanish City, Whitley Bay, is playing clarinet in a brigade band. He could have had a commission or a bandmastership, but was doing too well. He joined under the Derby Scheme. I am pretty well satisfied myself with conditions out here, but I do think it’s a bit ’empty when we see pictures in the Mirror, etc, out here of the Guards’ massed bands, 250 strong, mostly younger men than myself, many of them single, still at home, serving towards a pension. But, looking ahead, how are all the hundreds of men going to stand on returning, especially Londoners, finding these chaps of the Guards sill in their shops while they come home, out of practice for 12 months or more, and have to compete with Guardsmen who have been in touch with their instruments all along? The pictures and accounts of the visit of the Garde Republicaine and our Guards marching about London made some of us feel sick out here. I see there is a new Man-Power Distribution Committee at work, with two Labour MPS on it, to comb out young men from reserved occupations2. Well, I musty close now, hoping you and Jesson and all the rest are well. Don’t see much prospect of getting home for a bit unless I catch a ‘Blighty one’3. 2/19 London Regiment, British Expeditionary Force, France. 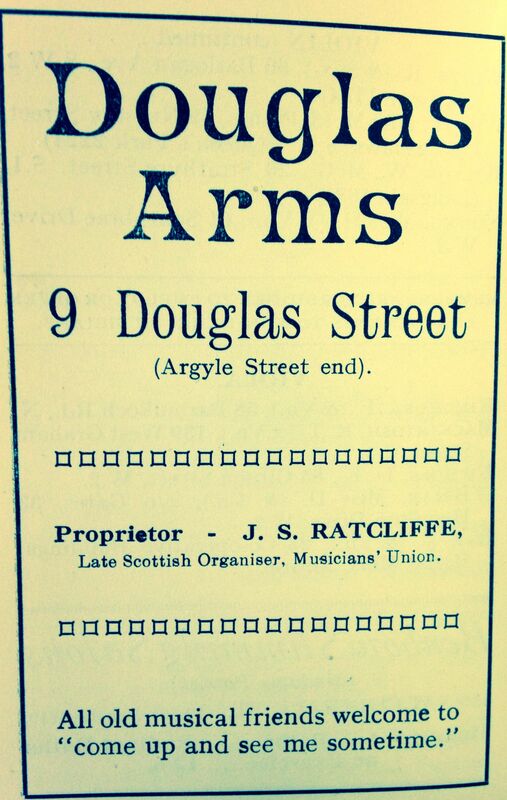 Although Ratcliffe’s war time activities are not further documented in subsequent issues of the Musicians’ Report and Journal, by 1919, he was back in his hometown of Glasgow, resuming his work as organiser and being at the centre of numerous disputes an court cases with various theatre and cinema employers of the time. In November 1920, he was elected a councillor in Glasgow, a position he hoped would be “of great service to the musical profession.” In 1931, in a reorganisation of Union personnel, he became Scottish organiser. He remained involved the Union throughout its most difficult times in the 1930s and, on retirement, he became a publican in the city, running the Douglas Arms. His son, Hardie, who by this point was a full-time official of the Union, went on to become its General Secretary in 1948.